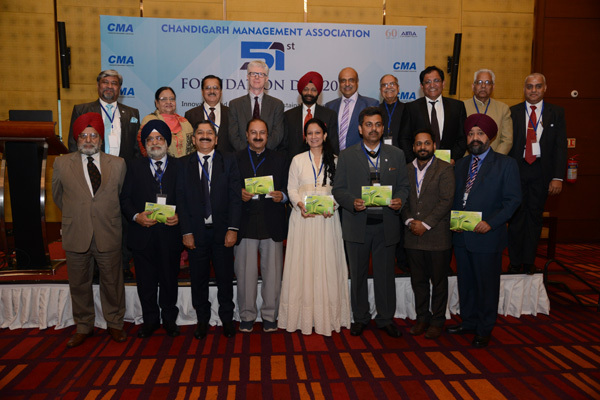 Chandigarh Management Association (CMA) celebrated its 51st Foundation Day on December 13, 2017 at Hotel Hyatt Regency, Chandigarh, which marked the beginning of a new era for the association. The theme of this foundation day was ‘Innovation and Technology for Sustainable Development. It was a magnanimous event where global leaders Dr. Christopher Gibbins, Consul General, Consulate of Canada and Mr. Partap K Aggarwal, Managing Director, IDS Infotech Ltd. participated as the Chief Guest and Guest of Honour respectively. CMA members with spouses attended the event and it was a gathering of more than 100 people. A Coffee table book depicting the events conducted by CMA since July 2017 was released by the Chief Guest Dr. Christopher Gibbins. An induction ceremony of the new members who joined CMA was also conducted during the event which was followed by a gala dinner. In this new era, CMA aims to carry forward the legacy and raise the bar of performance of this apex body of professional management by fostering persistent improvement in management practices for its stakeholders. We at the CMA envision partnership of professionals and corporates inspiring technological and research based management practices to create a platform of excellence.